Supported on rails, Double Girder Overhead Cranes can easily transport heavy loads weighing up to 200 t. Our cranes are composed of a hoist mounted on two beams.This crane can be used for any capacity where extremely high hook lift is required because the hook can be pulled up between the girders. 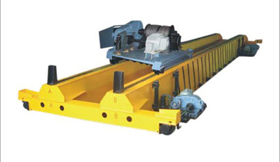 Double Girder Cranes have high capacity as compared to Single Girder Cranes and for heavy duty applications they can be supplied with open winch hoists.They are perfectly appropriate where the crane needs to be fitted with walkways, cabs, floodlights, magnet cable reels, crane lights or other special equipment’s. 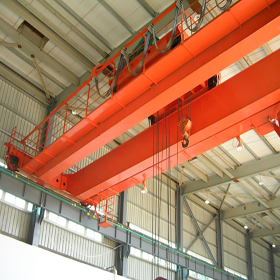 Double Girder Overhead Travelling Cranes offers exceptional load capacity and minimum deadweight. Attached with two torsion-free box girders, the crane is best for lifting and carrying the loads of over 10 T in the span of more than 15m. These are also ideal where high speeds and heavy service are required. Clients can avail Double Girder EOT Cranes at marginal prices. Our Double Girder Cranes finds application in power plant, transformer industry, workshop duty, steel plants, coal fields, cable industry, process plants, steel plants, coal fields, cement plants, engineering industry and others.